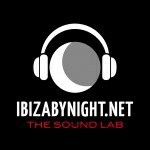 Ibiza by night presents: The Sound Lab episode #20 with Paolo Madzone Zampetti! The Sound Lab is back after the summer break! 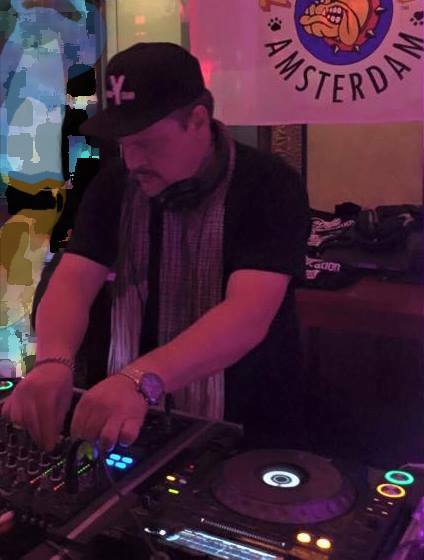 Ibiza by night presents today the 20th episode of The Sound Lab – Season 1 with a great new entry: Paolo Madzone Zampetti! Just to underline one of his jobs, in 2011, he took part with his dj set to the 10th Pacha anniversary in London where he was presented t o the public as “Italian underground legend” sharing the consolle with Stonebridge, Bodyrox, Jason Phats.lately he promoted and managed the party “Madzonegeneration” at WMC 2014 (Wmc official party) in Miami, wit h Seamus Haji,Gary Caos, Terri B, Alfred Azzet to, Miky J,Sean Finn,Larry Cadge… and he also participated with special swoops at Ade Amsterdam“. Here you have the link to Paolo’s Set! Then start to send there your sets… someone of our team will hear you – as we already said -and soon you could have nice surprises! And the list of friends that will be presented by The sound lab is already intriguing… after Paolo Zampetti, Inga, Alex Del Vecchio, Alejandro Scocco, Lorenzo Calvio, Elvio Iannitti, Ettore Ennetielle, Ivan Fly Corapi, Luigi Moretti, Sabrina Terence, Tania Moon, Maurizio Marengo, Resonant, Dennis Lado, Viktor Martini, soon we will introduce you some new and old friends as Ivan Fly Corapi, Alejandro Scocco, Miguel Gomez Fernandez and Emanuele Grossi! So Stay tuned! 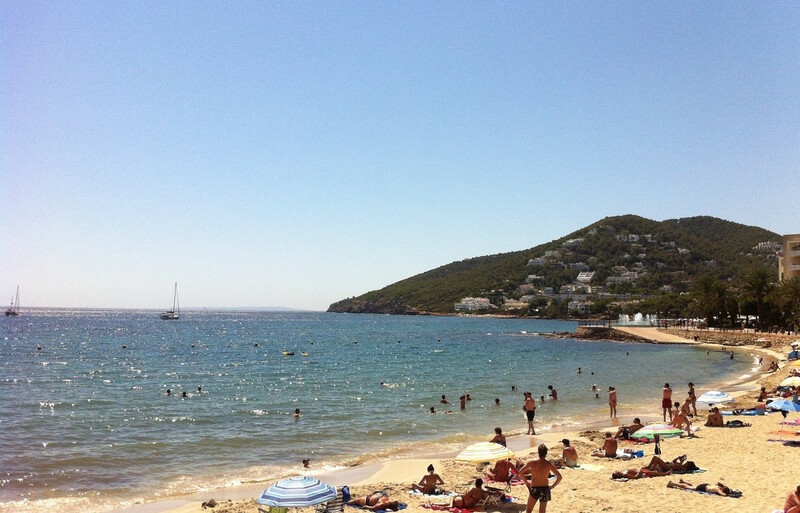 In Ibiza the first “Non smoking beach”! One more news for Ibiza 2016: there will be created the first “Non Smoking Beach” of balearic islands (and one of the few of Spain). The “Ayuntamiento de Santa Eulària” has decided that Santa Eularia’s beach will be a “Non smoking beach”. This project is the first of Ibiza, and it’ s focused in a location, Santa Eularia des riu, famous also for the family tourism. 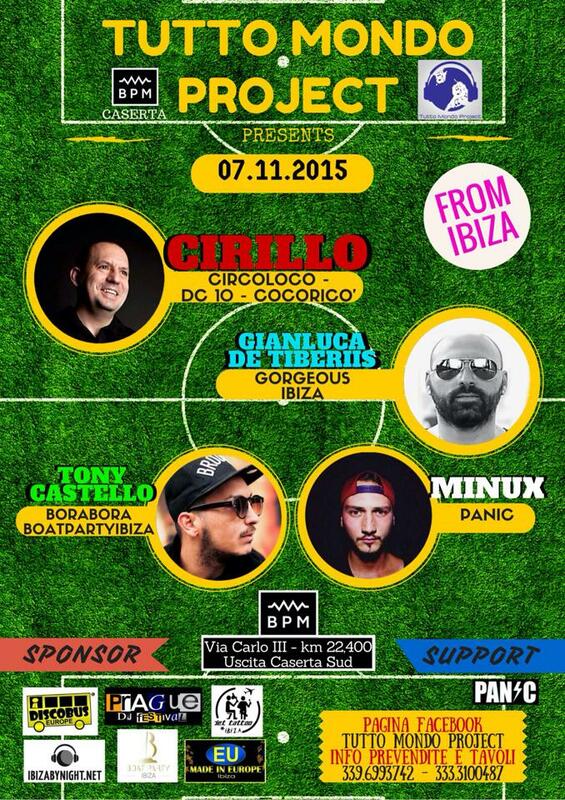 Cirillo, Gianluca De Tiberiis, Tony Castello and Minux will play in Caserta (Italy)! The sound of Ibiza lands in Southern Italy, in the city of Caserta. 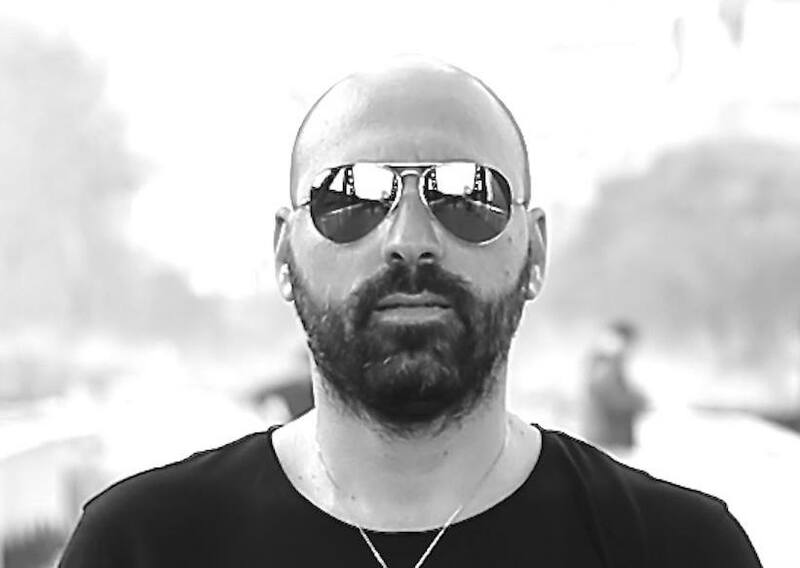 Cirillo, since years Dj of Circoloco Ibiza, Gianluca De Tiberiis (in the picture below) of Gorgeous Ibiza, Tony Castello from Bora Bora, an Minus will play next 7th of November in Caserta. So, if you are in that area, and you want to hear the music of Ibiza, save the date. Halloween at Pacha Ibiza, with free guest list! 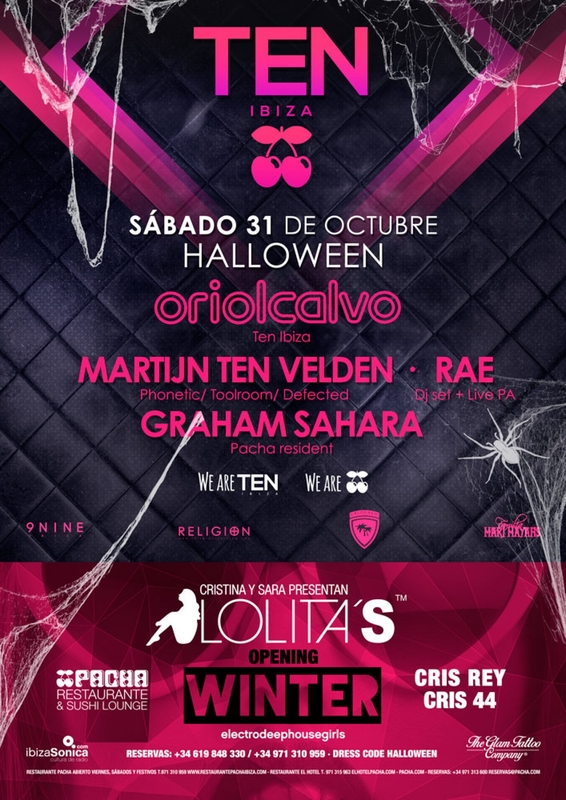 It’s time for Halloween in Ibiza, and Pacha Ibiza presents “Ten”. The line up includes the landlord Oriol Calvo, Martijn Van Telden, RAE & Graham Sahara. It’s possible to enter with the free guest list. See you Saturday 31st of October at Pacha! Ryanair announced New Ibiza Base To Open (No. 76) & Grow By 25%, plus a sale of tickets! Are you planning a an holiday in Ibiza for 2016? “Ryanair, Spain’s No.1 airline, yesterday (29 Oct) announced it will open a new base at Ibiza (No. 76), from March 2016, with 1 based aircraft (an investment of $100m), 2 new routes to Turin and Venice Treviso, and extra flights to a further 10 European destinations, which will deliver 350,000 new customers p.a. (1.8m in total) and support 1,400* “on-site” jobs, as Ryanair’s Ibiza traffic grows by 25%. 1,400* “on site” jobs p.a. “Ryanair is pleased to announce that we will open a new Ibiza base from March, our 13th in Spain, with one based aircraft and 25 routes, including 2 new routes to Turin and Venice Treviso, which will deliver 1.8m customers p.a. in total and support 1,400 jobs at Ibiza Airport as we grow by 25%. So, next 2nd of November, don’t miss this important opportunity! And be ready for Ibiza 2016! 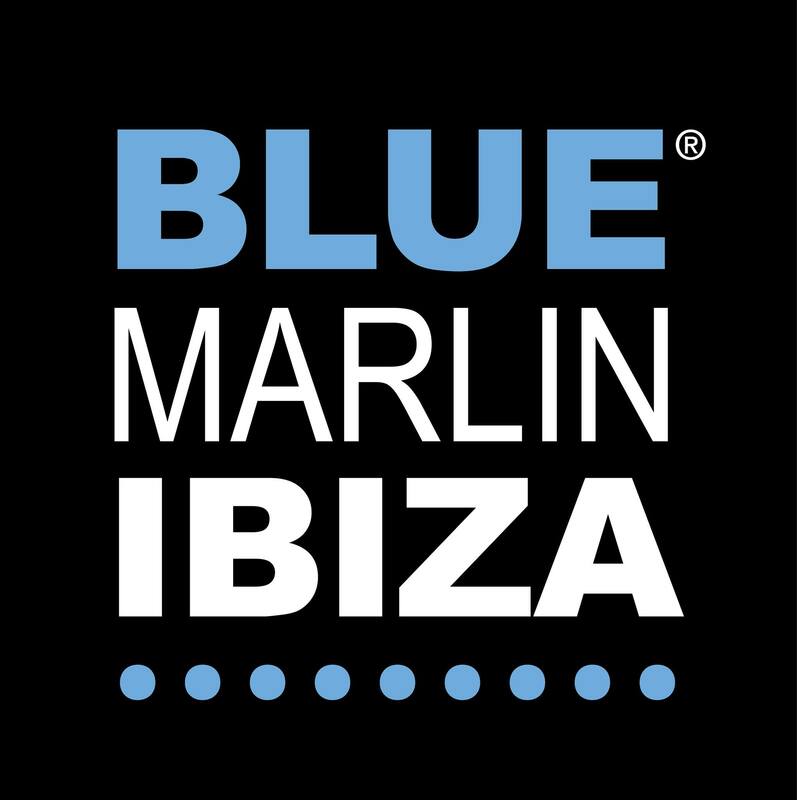 Blue Marlin Ibiza lands in Moscow and London! The iconic Beach Club presents two special events in two of the coolest capitals of the world. Let’s start from Moscow, when Blue Marlin will take place on 7th of November 2015 at the Duran Bar. The line up of the Moscow party will include also three dj’s residents of Blue Marlin IbizaValentin Huedo,Eli Rojas, Igor Marijuan. And there is one more surprise, the event will be live broadcasted on two radio stations: Ibiza Sonica and Blue Marlin Ibiza Radio. The second appointment will be in London next 14th of November 2015 at Novikov Restaurant. Save the date, because of it will be a night with excellent music and art will play So:Serious, the DJ duo resident at Blue Marlin Ibiza, and the singer Symone JBS, plus Citizenn v/s Who. So, if you are in those two cities, don’t miss the magical atmosphere of one of the famous Beach Clusb of the world. And here you have the official poster with the complete line ups. Ready for two unmissable parties in Moscow & London by night? Enter. LA Escape. The line up and the set times! With Richie Hawtin, Solomun, Loco Dice, Dubfire and many more! 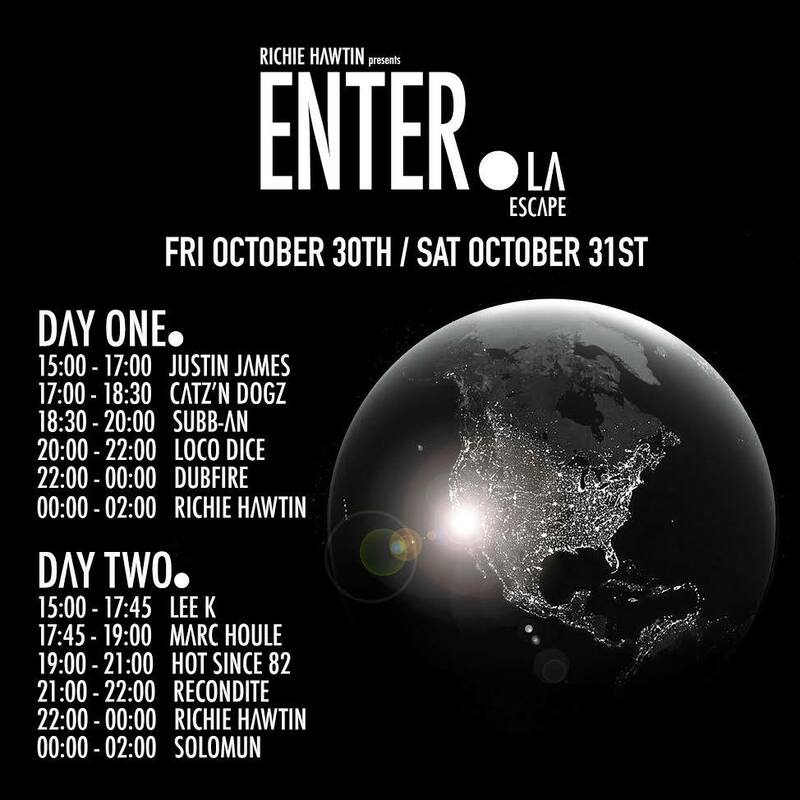 Enter., the cult party of Richie Hawtin and friends, after the great results of Ade 2015 and after the season at Space Ibiza, lands at Los Angeles for a double party and with great guests! The dates? Tomorrow 30th of October and Saturday 31st of October. The line up? 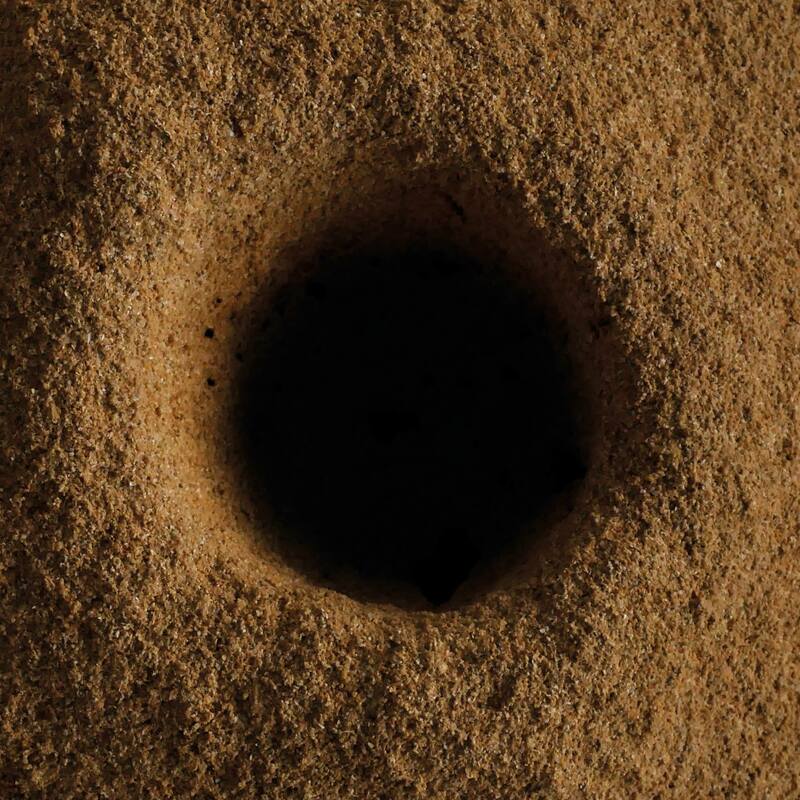 Includes big names, with Hawtin will play Solomun, Dubfire, Loco Dice, Hot Since 82, Recondite, just to tell some names!. This is the official poster with the complete line up and set times.